Spectacular McIntosh home with a wonderful cul-de-sac location and beautifully remodeled throughout! This home boasts 6 bedrooms, 5.2 baths, full finished walkout lower level, a library fit for a king, two screened in porches, large blue stone patio with fire pit, private back yard and tennis court!! Updated top to bottom. Newer kitchen with custom cabinets, granite counters, Wolf stove & double oven and Thermador refrigerator & freezer! Newly expanded 3rd floor with two additional bedrooms and a full bath. Second floor laundry and large loft! A master suite to die for overlooking tennis court and private yard plus an updated luxury master bath featuring a large tub, separate vanities & a huge shower. Not a thing to do, but move in and enjoy. 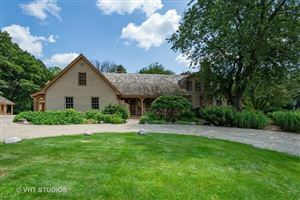 This property is a dream for raising a family & entertaining and is located in one of Inverness's most prestigious streets in the coveted Fremd area.